Three-In-One Concepts is an educational corporation based in Thousand Oaks, California with the purpose of assisting individuals who are interested and willing in taking responsibility for creating their wellbeing personally and professionally through the integration of Body, Mind and Spirit. Developed by Gordon Stokes, Daniel Whiteside und Candace Callaway in the 80s, it’s a worldwide accepted approach today. For technical products Three In One is just a synonym for a set of three features implemented in just one product. Three-In-One concepts are well-known from printers. For printing, copying, and scanning documents there is just one device which does it all. Within app development I found out an approach to combine note taking, outlining, and mind mapping resp. concept mapping. 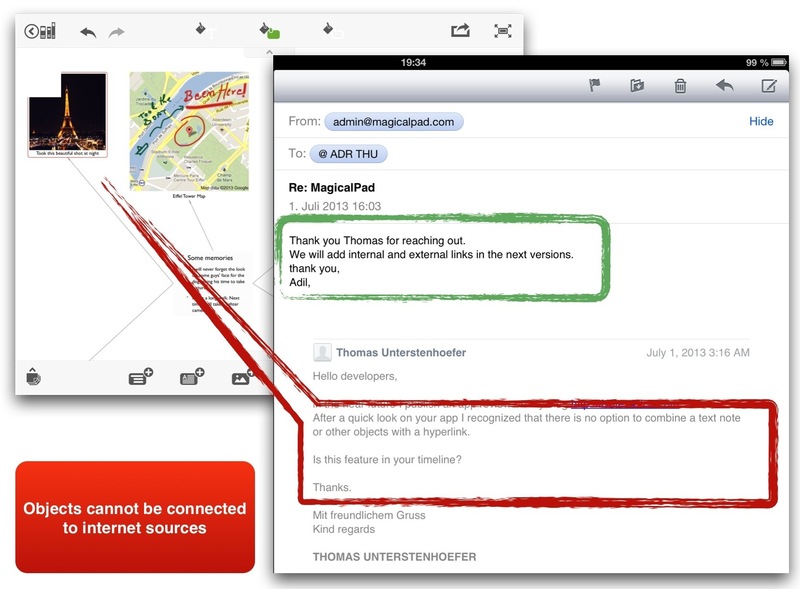 The app is named MagicalPad by MagicalPad, USA. MagicalPad is a Massachusetts based start-up provider of innovative mobile and web-based applications for visually organizing and managing information and ideas to drive structured thinking, spark creativity, and enhance business innovation and team effectiveness. The thousands of users who use MagicalPad understand the value of structured notes to help structure their thoughts and ideas. MagicalPad has quickly become THE app for many business users for brainstorming, meeting notes, project notes, school notes, mind mapping, creative writing and other information management and outlining needs. This announcement forces me to dip into the details. Does this app really combine all these features? What you should know is the meaning of the term ‘Notebook’. The developer uses it for single projects consisting of ‘Pages’. Notebooks can be created on the home screen and pages on the worksheet. It’s comparable with files (Pages) in folders (Notebooks). Here is a full feature description visualized as a mind map created with the app iThoughts HD for the iPad. An image often says more than 1000 words. Not all readers are familiar with all the abbreviations used in the IT world. So UI means the User Interface and describes the layout of an app seen by a user. Developers should follow some standards published by Apple in The iOS Human Interface Guidelines. UX means the User Experience and describes what users feel when they use the app the first time and extensively later on. The impression must be positive to keep the app on the device for further usage. Both UI and UX are in some way subjective criteria. So take a look on these screenshots and build your personal opinion. What you cannot retrieve from these screenshots is the feeling when interacting with the app. Sorry, but you have to buy it to check this out. What I recognized on my iPad 3rd Gen was a stuttering behavior when moving objects and slow performance when loading complex notebooks. Nearly all apps available at Apple’s App Store use native file formats. So sharing of files with other people not using the same app is an important criterion when it comes to collaboration. OPML (Outline Processor Markup Language) is an XML format for outlines. Each node contains a set of text values. 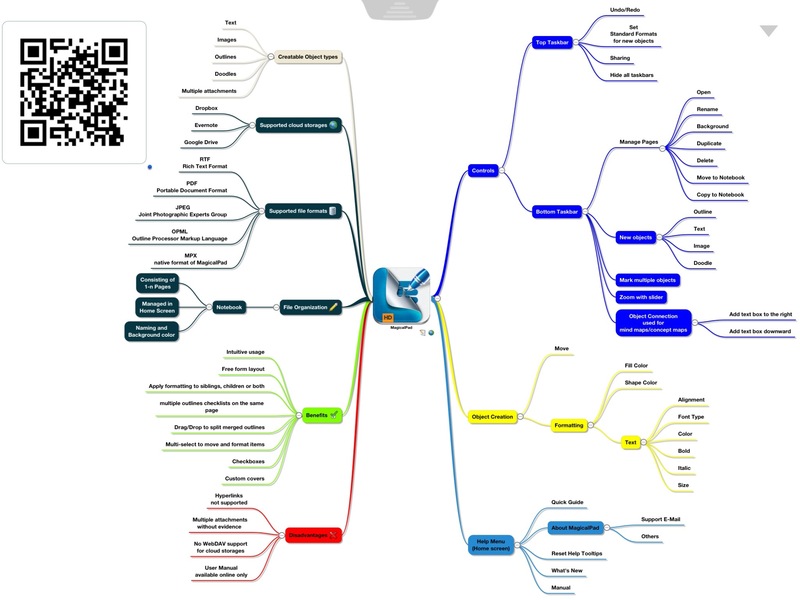 While using the app as a mind mapping tool I recognized that there is no automatic combining of topics. So it’s an ugly work to manually set every single arrow which combines a topic with a subtopic. The performance of displaying objects when loading a page is near to be not acceptable (iPad 3 rd Gen). Moving objects to new positions is a bit jumpy. Objects cannot be connected to internet sources by attaching a hyperlink. The support is perfect. The company answered immediately even on further questions I had. Like all the other apps I reviewed here on http://iNotes4You.com there is still some work to do for the MagicalPad developers. 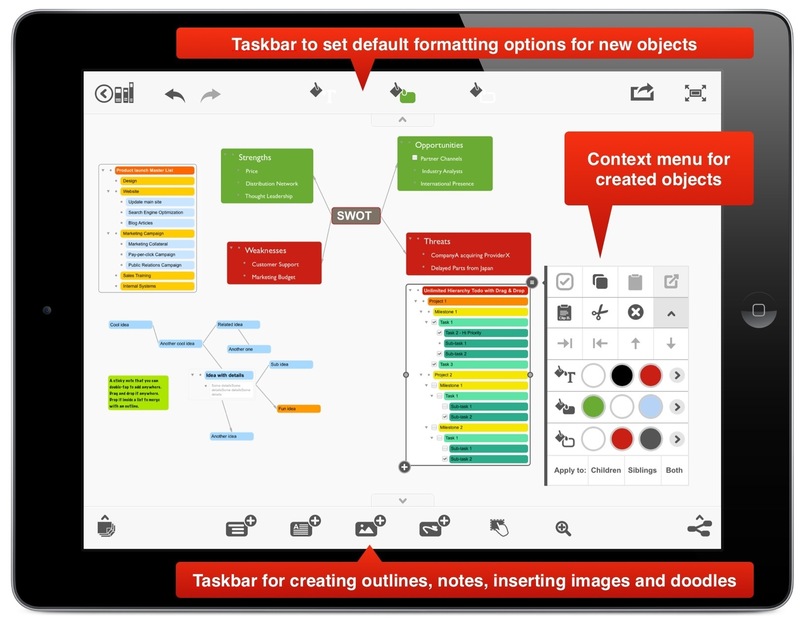 The mind mapping features are stunted compared to specialized apps whereas the outlining feature is well-developed. What can be named as MAGIC is the idea to combine outlining, mind mapping, and note taking. It’s an ongoing experience to see useful features in one app that are missing in another app.